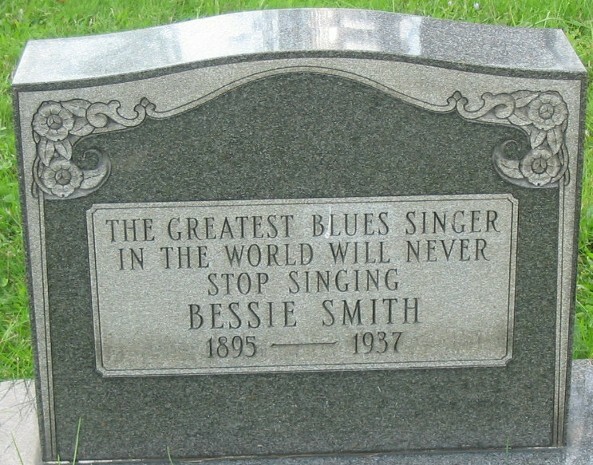 Blues great Bessie Smith (1895-1937) was born into poverty in Tennessee and was discovered singing on street corners at a tender age by Ma Rainey. Though Smith later married a man, she enjoyed numerous sexual relationships with lesbians and bisexual women on the touring circuit, one of whom, Boula Lee, was the wife of her musical director. It has also been suggested that Ma Rainey was her first lover. Smith’s lesbian affairs were a frequent source of tension with her husband, Jack Gee, from whom she eventually separated. During the 1920s, Smith’s popular “race records” – including “Down-Hearted Blues,” “St. Louis Blues,” “Nobody Knows You When You’re Down and Out,” and “Gimme a Pigfoot and a Bottle of Beer” – won her the title “Empress of the Blues.” Tragically, she was killed in an automobile accident while making a concert tour of the South and was buried in an unmarked grave at this site outside of Philadelphia. In 1970, rock singer Janis Joplin – who cited Smith as a major influence on her own career – helped secure this headstone, along with the daughter of Smith’s former maid. A few months later, Joplin herself died of a drug overdose. …There’s two things got me puzzled / there’s two things I don’t understand / That’s a Mannish acting woman / and a skipping, twistin’ woman-acting man.